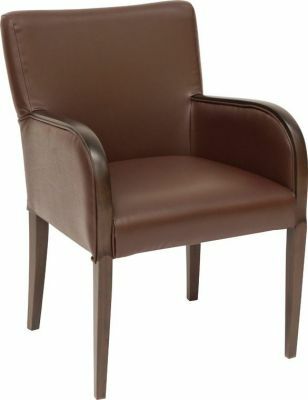 Leather armchair in Brown faux leather with a solid wood frame in a Walnut finish and full arms. Available from stock for a fast and free delivery. Free United kingdom delivery service. Designer leather armchair with a square backa nd curve upholstered arms, suitable for a wide range of dining establishments such as public houses.